Euro zone leaders have reached a deal to form a "Euro-Plus-Pact" providing for closer economic coordination between Euro Area states and non-euro countries which volunteered to join, including Bulgaria. The "Euro-Plus-Pact" – initially known as a euro zone competitiveness pact or just an euro pact, proposed last month by German Chancellor Angela Merkel and French President Nicolas Sarkozy – was agreed upon in Brussels Thursday where EU 27 leaders came together for an European Council meeting, EU Observer reported. In addition to the 17 Euro Area countries, six non-euro-using states – Denmark, Poland, Romania, Bulgaria, Latvia and Lithuania – have opted to join the Euro-Plus-Pact, with the UK, Sweden, Hungary, and the Czech Republic staying out, at least at the current stage of its formation. The "competitiveness pact", a plan for closer economic integration, has been widely described by international media as being demanded by Germany as the price for dipping in its pocket to boost the EU's bail-out funds for countries in financial trouble such as Greece, Ireland, and now, likely, Portugal. At first, the "Pact for the Euro", another one of its names, elicited a strong negative reaction from European states both within and outside the euro zone when it was first unveiled by Merkel and Sarkozy last month. Since then it has been watered down to include a set of non-binding targets for harmonising policy in a range of areas - from labor markets and retirement ages to debt and corporate taxes. Germany has stressed that non-euro members will not be excluded from annual discussions on economic convergence that are foreseen in the pact if they elect to become a part of it. The most virulent criticism against the Euro-Plus-Pact has been that it literally creates a two-speed Europe – a Europe with a stronger integration around the Franco-German corps, and a more estranged periphery. Thus, it would break the taboo of institutionalizing regular meetings of the euro zone leaders, while currently all EU states take part in the major euro zone discussions. International reports initially listed Bulgaria as one of the "euroless" state that will stay out of the pact together with the Brits, Swedish, Hungarians, and Czechs. Those appeared not to be completely unfounded as Bulgarian Prime Minister Boyko Borisov revealed in Brussels Thursday that key government figures were opposing Bulgaria's joining the Euro-Plus-Pact at this stage. However, an agreement in favor was reached eventually. Thus, Thursday morning before flying off to Brussels, Borisov told the Members of the Parliament Bulgaria will support the so-called "Euro Pact." 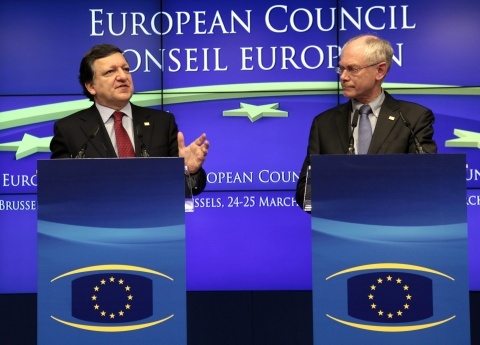 "The political agreement for the Euro-Plus-Pact will be debated by the European Council. We will back it. The financial and economic crisis showed us we need improvement and stabilization," Borisov said. "The Bulgarian cabinet should not stay outside this key pact. Bulgaria's joining of the Eurozone is crucial for the country because it is a matter of economic stability. Our country will avoid the establishment of a two-speed Europe. We have always worked to get closer to other EU Member States; to halt irresponsible fiscal policies," the PM told the MPs. Borisov pointed out the currency board was a good move because it was established to tame the economic crisis in 1996 – 1997, but it is no longer sufficient, adding for this reason Bulgaria will join the "Euro Pact." "Our support is mainly a matter of principle," the PM stated. Bulgaria's Finance Minister Simeon Djankov and Bulgarian National Bank Governor Ivan Iskrov were against Bulgaria's joining the pact of measures to ensure closure economic coordination of the euro zone countries, termed by European Council President "euro-pus pact", Bulgarian PM Boyko Borisov said in Brussels as he was attending the meeting of the European Council and a summit of the European People's Party, as cited by BTA. "Everyone's opinion at the end of the day boiled down to this that if we don't join the euro pact now, Bulgaria will be learning only from the media what's happening in Europe, and then we will have nobody to be mad at that there is a two-speed Europe," Borisov stated. "If we want to be competitive to the other economies, we just have to join the pact. Are protests going to feed us? Let's assume everybody is protesting today. Where are we going to get money from tomorrow? That is why Europe is rightist today – because this has always been the engine generating innovations and productivity; this is what leads to a better life – not social concessions and protests," Borisov said. He did also mention that during the EU Council he will stick to Bulgaria's position against common EU tax rates because the fact that Bulgaria has the lowest taxes in the EU is its way to being internationally competitive.